Melissa Hubbard engages with students and views students’ success as her No. 1 priority. Melissa Hubbard of Val Vista Academy in Gilbert has been chosen as Taylor Morrison and KEZ 99.9’s “Excellence in Education” winner for the month of May. It’s heartwarming to hear this story about Melissa Hubbard’s exceptional teaching abilities and her selfless acts to ensure the well being of her students. 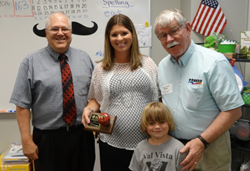 During the 2013-2014 school year, Taylor Morrison and KEZ 99.9 have recognized one exceptional Valley educator to honor as part of the radio station’s “Excellence in Education” recognition program. 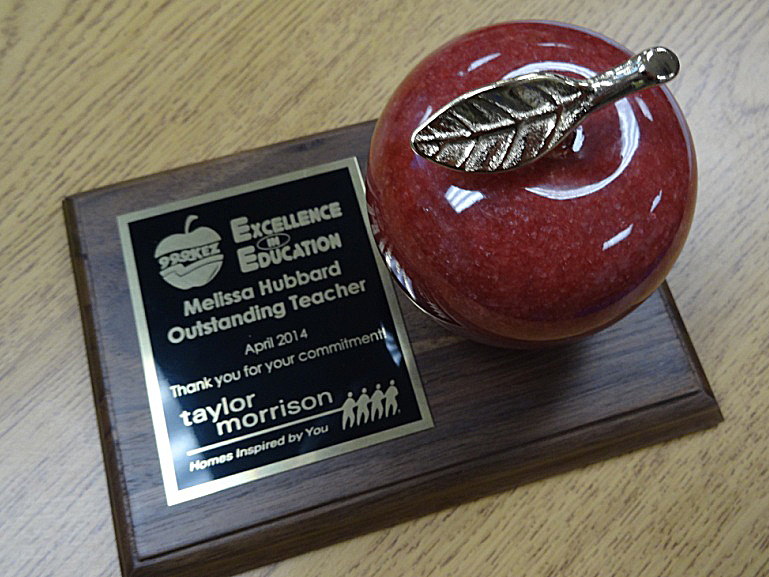 Hubbard will receive an “Excellence in Education” plaque from Taylor Morrison and KEZ 99.9, $99 and a prize for her outstanding educational efforts and big heart - both inside and outside of the classroom. Nominator and mother of two that have been taught by Hubbard, Karen Fontana, a mother whose two sons have had Hubbard as a teacher, said that the educator had stepped in and assisted her family during a time when they needed the help, arranging for one of her sons to receive a school scholarship. During the holiday season, Hubbard also provided the family with gifts to lift their spirits. When Fontana’s two sons were struggling to write their names, Fontana said Hubbard spent extra time encouraging the boys. Within a few days, both boys had learned to write their names. Thanks to Hubbard, both of Fontana’s sons are thriving at school with one son currently reaching the honor student level. Previous winners have included Cat Lollis of North Canyon High School, Cassi and Pete Mackey of Montessori Education Centre, Jeremy Rubel of Copper Trails Elementary School, Monique Pena of Charlotte Patterson Elementary School, Julie Pascal of Diamond Canyon School, Chris Whitehead of Freemont Junior High School, Cindy Cordts of Oakwood Elementary and Michelle Capriotti of Charlotte Patterson Elementary. Each month, KEZ’s Marty Manning surprises the new winner with a visit and presents them with their Excellence in Education award. The visit is broadcast during the” Beth and Friends” morning show, which airs weekdays from 5-10 a.m.
At the culmination of the school year, each “Teacher of the Month” winner will be invited to attend a banquet at The Capital Grille in Phoenix where $999 will be awarded to one special educator. For more information or to nominate someone please visit http://www.kez999.com. For more information about Taylor Morrison and its communities, please visit http://www.taylormorrison.com/phoenix.